Philosophical Investigations: Is Political Science Science? Is political science science? The political philosophy of Thomas Hobbes would seem to present us with a test case par excellence. 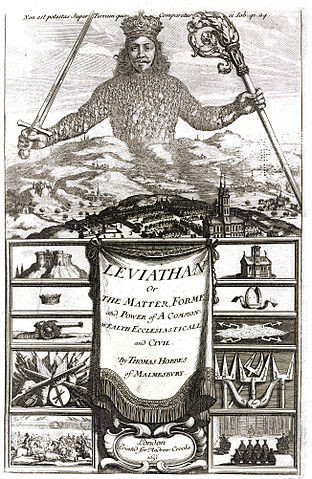 Claiming that his most influential work, Leviathan, was through and through scientific, Hobbes wrote, ‘Science is the knowledge of consequences, and dependence of one fact upon another.’ His work, he judged, was founded upon ‘geometrical and physical first principles of matter and motion’, combined with logical deductions of the human sciences, psychological and political. Through his scientific researches, Hobbes came to hold a pessimistic view of human nature, which he called the ‘state of nature’, the ‘Natural Condition of Mankind’: a ruinous state of conflict. Paradoxically, he considered that such conflict arose from equality and rationality. Possessing limited resources, a rational man would try to take as much as possible for himself. At the same time, others would need to do the same, as a defensive measure. The likeliest outcome was ‘war of every man against every man’, where law and justice have no place. Such a life, he famously wrote, would be ‘solitary, poor, nasty, brutish, and short’. Hobbes proposed, therefore, a contract between the people and the Sovereign, as a means of creating peace by imposing a single, sovereign rule. It is the fear of punishment, he wrote, that preserves peace and unity, and ties people to the ‘performance of their Covenants’. Following his logic, individuals are likely to reach the conclusion that a social contract is the best alternative to their natural condition, so surrendering their liberties and rights. On the surface of it, Hobbes' logic seems compelling, his deductions persuasive, his arguments admirable. Nonetheless, for a number of reasons, it is questionable that his analysis of human nature was truly scientific. His 'state of nature' was not well founded in history. In Philosophical Rudiments, he wrote (much as he did more generally) that the existence of the American tribes was ‘fierce, short-lived, poor, nasty, and deprived of all that pleasure and beauty of life’. Yet rather than supporting his arguments, this appears to prove him wrong. Historians have generally claimed that the Indians were simple, peaceful, innocent, and uncorrupted by the evils of civilization. Hobbes, it seems, may have absorbed the Puritan tendency of separating the ‘natural’ as regressive, and the non-natural as progressive. Furthermore, Hobbesian political philosophy becomes complicated when it comes to the fact that his work was both descriptive and prescriptive. The descriptive side is present in his analysis of the state of nature, while his idea of the Sovereign and the Social Contract as a universal solution is evidently prescriptive. Today we are keenly aware of the difficulty of passing from descriptive to prescriptive language. Not only that, but Hobbes' prescriptive language seems to be excessively strong – even emotional. More than anything, Leviathan reveals that fear was a core element in Hobbes' political study and life. This may be most explicit in his verse autobiography: 'For through the scattered towns a rumor ran / that our people's last day was coming in a fleet / and so much fear my mother conceived at that time / that she gave birth to twins: myself and Fear.' Happy is he, he wrote, quoting Virgil, 'who treads beneath his feet all fear of Fate'. Could it be, then, that Hobbes' political philosophy was born of his own personal history? That it was his own experience of fear which shaped his so-called 'science'? In fact, that his mother's fear of a fleet outweighed all subsequent thought? If this should be true, what implications may this have for our understanding of political philosophy today? May our political philosophies be shaped by our emotional and historical heritage? May this be a survival mechanism – a memory of the past which cannot be erased through any 'scientific' theory? Were Plato, Aristotle, Machiavelli, Marx, Rawls and so many others with them – mere symptoms of their times – in fact, symptoms of the times which preceded them? The word science, (like social), has been ascribed in combination to other branches to subdivide specialism. To be honest, I have never truly understood those ascriptions (and the term human sciences caps everything). From a structural point of view these terms appear logic, for we accept these subdivisions; from another point of view the question is whether these combined terms are necessary for observations that come along in reflection and study? For if one presupposes f.e. political philosophy as science, would that not at the same time restrict the field in which to work? There is an innate ambivalence in ascribing a study to a specific branch in the sense that the work has' to fit back into a container’ for if the container lacks, the work does not exist? Maybe ascribing a set of thoughts to a subdivided branch serves to give things a function, so we can ‘put those thoughts somewhere.’ A practical issue? As long as things have to belong to something we can manage them, in contrast to what human nature maybe is, something not manageable? Is political science science? appears as a question whether that term adds significant meaning to the content or decorates the content to be somehow labeled? But does the content change by such terms or not? Would there be another outcome? While I find the critique of Hobbes legitimate, the statement "Historians have generally claimed that the Indians were simple, peaceful, innocent, and uncorrupted by the evils of civilization" is just downright incorrect. Several Native American civilizations, beginning at least as far as 500BC were highly advanced and urbanized. More recently, the Maya, Inca and Aztec empires were most certainly not peaceful, nor simple, nor uncorrupted. A good place to correct the view advanced by the authors is Charles Mann's "1491: New Revelations of the Americas Before Columbus." And, yes, like Eduardo, I also stumbled over the reference to the American Indians. Hardly living in the 'state of anarchy' if in a sense closer to 'nature'. A very sophisticated if obviously also very different, cluster of societies that the first settlers were happy to exploit the wisdom of. Their later genocide is proof that life under one nation's absolute ruler brings no security to the rest of the world. As, indeed, Hobbes acknowledged. Yes it seems that there's been a sea change in perceptions of 'American tribes'. This implies, though, that former perceptions rested on arguments from silence. How did that happen? More generally, I think that Bohdana makes a crucial point in suggesting that political science may be shaped by largely unacknowledged dynamics which in fact eclipse the science. Thank you, Bohdana, for a very interesting discussion of the topic, in particular of one slice of Hobbes’s political philosophy. I must admit, however, that the title caused me to linger for a while. The reason is that, for me, the answer to the question that the title poses, “Is Political Science Science?,” is no. You seem to draw the same conclusion: “[F]or a number of reasons, it is questionable that [Hobbes’s] analysis of human nature was truly scientific.” I agree, but let me expand a bit, broadening out beyond Hobbes. My reasoning is that science – more precisely, natural science – is characterized by qualities not shared by the social “sciences.” Those qualities include methodological rigor, precision, prediction, testability, reliability, mathematical expression … and more. Whereas physics, chemistry, biology, astronomy, and other sciences may lay claim to such qualities, disciplines like psychology, sociology, anthropology, economics, and political “science,” among others, arguably do not. And even though, to give just one instance, psychology benefits from the harder-nosed discipline of neuroscience, that does not endow psychology with the other qualities essential to science. To state the obvious, far more is at play regarding the label “science” than what was captured by Hobbes’s words appearing in the essay’s opening paragraph: “Science is the knowledge of consequences, and dependence of one fact upon another.” And, as you say a little later, that Hobbes’s work was founded upon “‘geometrical and physical first principles of matter and motion,’ combined with logical deductions of the human sciences, psychological and political.” To be sure, political science, as with all the other social disciplines listed above, add immeasurably (measurably?) to human understanding. And, again to state the obvious, we are all better off, for many reasons, for their being among our fields of study. Including their leading to actionable insights into individual, group, and institutional behavior. No one, I suspect, would heavily push back on that front. Human life is, of course, made all richer by the presence of these other disciplines. They pose worthwhile questions, and offer worthwhile answers. And we are all aware, on an everyday level, of the impact on our lives from the social sciences, including political science. But that’s very different than saying, as the essay’s title asks, that political science is science. Anyway, many thanks again, Bohdana, for a wonderful read: your treatment of the subject provided considerable food for thought! I noted in my Metaphysical Notes that it is one thing to arrange the world in one's own mind, another to discover how the world is arranged in other people's minds. I gave the example of a chess player who arranges a chess board in his mind, when one or more others begin to interpose on his game. His task becomes enormously more complicated, and his time too little. The way that others arrange our world poses various problems. This is known only through semiotic codes. These semiotic codes may not be what they seem. And the more others we need to take into account, the more our own arrangement of the world slips out of reach. Thus the natural sciences deal with a unified view of our world, as if it were one person, while the human sciences pick up all that introduces others into the picture. The Nobel Prize laureate Herman Simon, an influential scholar of political science, economics, sociology, psychology, and computer science, was asked whether the social sciences would ever be on the level of the natural sciences in terms of precision and predictive prowess. His answer was an emphatic, “No, because the subjects of our study think.” His succinct answer—worth pondering for a moment—is of course correct now, and will be for many years. Humans are, of course, among the most complex systems. However, Simon’s answer was forged on the anvil of the twentieth century. As physics, chemistry, biology, neuroscience, artificial intelligence, quantum computing, big-data analytics, and other fields enter the social ‘science’ fray more fully than they do today, Simon’s answer—though right at the moment—will almost certainly have to shift significantly.